Will Game of Thrones Season 7's War Be Between Jon Snow and Sansa Stark? War is coming to Game of Thrones, the trailers have made that much clear, but war between whom? Could it be current allies Jon Snow (Kit Harington) and Sansa Stark (Sophie Turner)? "There is definite tension between them right from the first scene," Harington told EW. "There are the same problems — she questions his decisions and command; he doesn't listen to her. But as far as where that goes or takes them or how dark it can get, we'll see. It gets past sibling squabbling, it gets into two people power struggling." Last season ended with Jon Snow becoming King in the North, a moment that was capped with a glance between Sansa and Littlefinger (Aiden Gillen) that hinted at things to come. Viewers also learned Jon Snow isn't Ned Stark's son, rather his nephew. He's the son of Lyanna Stark and Rhaegar Targaryen. 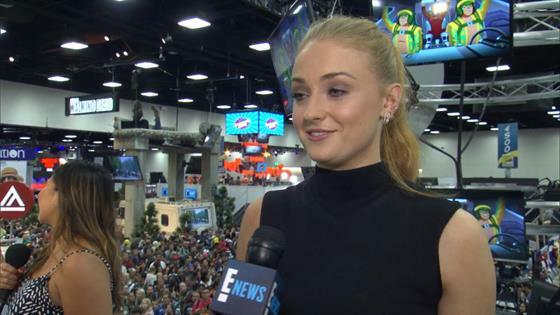 "From my perspective, I want her and Jon to kind of rule together because it worked in the first instance in the Battle of the Bastards, things went pretty smoothly," Turner told E! News at Comic-Con in 2016 (see the interview above). "I would want them to kind of rule as a duo, but I don't think that's going to happen because it's Game of Thrones and nothing good ever happens on Game of Thrones." After the finale aired, HBO released a behind-the-scenes video detailing the events of the episode with commentary from the stars. Sure, Sansa Stark and Jon Snow retook Winterfell from Ramsay Bolton (Iwan Rheon), but Harington's character isn't giving Turner's the attention she deserves when it comes to ruling. "I think Jon is oblivious. He hasn't actually learned his lesson from actually trying to pay attention to what she's feeling," Harington said about what awaits Sansa and Jon. "He says he has, but he's asking her to trust him. He's not listening and watching and observing her. I think that could be a real problem for him."